Come Watch the PBC Lions Roar! 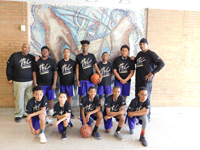 I caught up with Providence Baptist Church Lions youth basketball coach Bill Tufts on Monday to see what is happening with the junior and senior squads. Staff: How many young men are on the teams? Staff: Well tell us how the teams are doing this season. Coach Tufts: Both teams are having great seasons. Our juniors experienced their first loss this past Saturday and have a record of four wins with a single loss. Our senior team is currently 3-4. Both squads are in the playoffs that start this Saturday. The junior team is the 2nd seed and the senior team is the 3rd seed. Staff: I've heard a lot of good things about the league. Do you have anything you'd like to share with our readers? 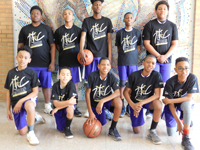 Coach Tufts: The name of the league is the "Winter Basketball League" and it's sponsored by Christ Community Church. There are five junior teams and eight senior teams. Staff: Basketball games are exciting. Yet I know you and your staff are about developing young men. What is your mission statement? Coach Tufts: To bring the gospel of Jesus Christ to unsaved young men, and to fellowship with our young Christian brothers, training them to become physically strong as well as strengthen them spiritually through the word of God. Staff: For those of us who have not seen the teams play, can you share a memorable moment with our readers? Coach Tufts: Every fourth Sunday is JUMP Sunday at the Providence Baptist Church Euclid campus. Five of our young men came forward to accept Christ. Staff: How do you run your practices to develop the spirit and mind of your players? Coach Tufts: We run our practices at St. John Luthern School on Mayfield Road in South Euclid. We practice on Wednesdays and Thursdays from 6-7PM. This is the only court time we could get. Before we practice, we gather together in a prayer circle. Afterward we go through drills and plays. After practice we pray again. This is the same process each team in the Winner Basketball league follows for their practices. At our games we also have prayer. The home team prays first, following by the visiting team. Staff: Every great coach has a great staff. Tell our readers about your coaches. Coach Tufts: I have three assistant coaches: Al Drummer, Mo Evans and Lem Williams. both Al and Lem are East High School graduates who played basketball for them. Staff: Do you have anything else you would like to share? Coach Tufts: We have two young men from last year's team. One of them is Byron Hamilton. This year he won the 3 point shooting contest sponsored by the Christ Community Church league. We are so proud of each and every one of our players. The Winter Basketball League has life session requirements. All players must attend a one hour life session prior to each game. All players must be on time. If a player is even one minute late he is not allowed to play. We are teaching responsibility and the necessity to come early. For those students without transportation this can be tough. We also need for our parents to make a commitment to what we are teaching these young men. On Saturday March 31st the PBC Lions enter the post seasson of the Winner Basketball league. The games are being played at Luther East High School.